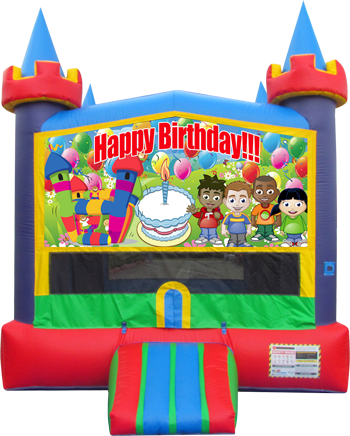 This Happy Birthday Bouncer is a big favorite for those special birthday parties. This 5x15 bounce house with a basketball hoop inside is a great way to celebrate any birthday party. It also has mesh windows on all 4 sides for easy viewing. The Birthday bouncer has a great color scheme to match almost any party. This Birthday bouncer was made in the USA.